WASHINGTON — A new American intelligence assessment of global threats has concluded that North Korea is “unlikely to give up” all of its nuclear stockpiles, and that Iran is not “currently undertaking the key nuclear weapons-development activity” needed to make a bomb, directly contradicting two top tenets of President Trump’s foreign policy. Dan Coats, the director of national intelligence, also challenged Mr. Trump’s insistence that the Islamic State had been defeated, a key rationale for his decision to exit from Syria. The terrorist group, the annual “Worldwide Threat Assessment” report to Congress concluded, “still commands thousands of fighters in Iraq and Syria,” and maintains eight branches and a dozen networks around the world. Mr. Trump is expected to meet next month with Kim Jong-un, the North Korean leader, in a second round of direct negotiations aimed at ridding Pyongyang of its nuclear weapons. “Its leaders ultimately view nuclear weapons as critical to regime survival,” Mr. Coats said. 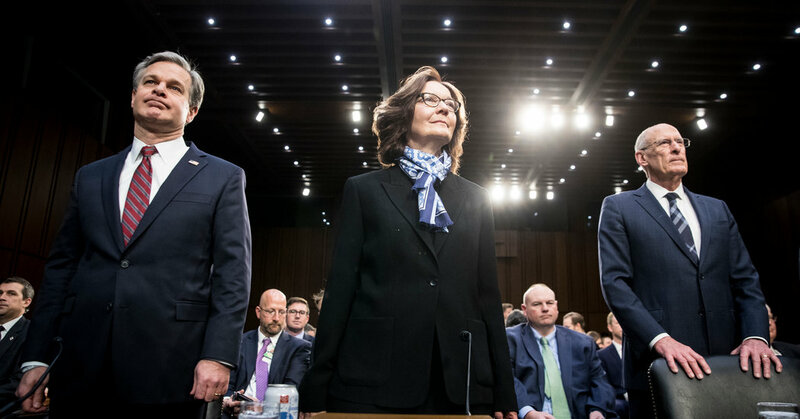 Under questioning by Senator Kamala Harris, Democrat of California, Ms. Haspel said it was encouraging that North Korea had engaged in dialogue with the United States. But, she said, ultimately the diplomatic objective had to be to persuade Pyongyang to fully disclose its program and dismantle its weapons. Former intelligence officials have expressed a degree of skepticism about the upcoming meeting, given the relatively modest steps North Korea has taken toward throttling back its nuclear program. On Iran, Mr. Coats cited the nation’s continued support of terrorism in Europe and the Middle East, including sponsoring Houthis in Yemen and Shiite militants in Iraq. He also said that he believed that Iran hard-liners would continue to challenge centrist rivals. “We do not believe Iran is currently undertaking the key activities we judge necessary to produce a nuclear device,” Mr. Coats said, but he added that Iranian officials have “publicly threatened to push the boundaries” of the nuclear deal it struck with world powers in 2015 if it did not see the benefits it expected. Mr. Trump withdrew the United States from that agreement last year. He called it “defective at its core” and said if the deal remained in place, Iran would“be on the cusp of acquiring the world’s most dangerous weapons.” The agreement still stands, largely with support from European capitals. Senator Angus King, the Maine independent who caucuses with Democrats, asked Ms. Haspel point-blank if Iran remained in compliance with the nuclear deal. She said it was, but added that Iranian leaders were considering steps that would “lessen their adherence” to the agreement. Intelligence officials have long taken stronger positions than Mr. Trump on North Korea’s continuing nuclear activity, the strength of the Islamic State and Russia’s attempts to influence elections. April F. Doss, a former associate general counsel at the National Security Agency, said the most recent National Intelligence Strategy made a point of highlighting the responsibility of the intelligence agencies to “speak truth to power” and to deliver intelligence objectively. “They are going to be very mindful of reassuring the Intelligence Committee and the public they are committed to carrying out their work in an apolitical, nonpartisan fashion,” said Ms. Doss, now a partner at the law firm Saul Ewing Arnstein & Lehr. Perhaps the strongest rebuke of Mr. Trump’s security priorities comes in what is missing from the threat assessment: any rationale for building a wall along the southwestern border, which Mr. Trump has advertised as among the most critical security threats facing the United States. The first mention of Mexico and drug cartels comes on Page 18 of the 42-page report, well after a range of other, more pressing threats are reviewed. Much of the new assessment, as well as testimony at Tuesday’s hearing, focused on cyberthreats against the United States from China and Russia. For the first time, the report concluded that China is now positioned to conduct effective cyberattacks against American infrastructure, specifically citing Beijing’s ability to cut off natural gas pipelines, at least briefly. Taken together, the report paints a picture of threats vastly different from those asserted by Mr. Trump. Russia emerges as a disruptive threat, China as a long-term one, and the failure of the United States to invest heavily enough in research and development for key technologies as perhaps the biggest concern, allowing new competitors to close the technological gap.